Jason Little and Dan Berry got together to talk about stealing like an artist, traditional and digital production and Jason’s cartooning DNA. Jason’s book Borb is published by Uncivilised Books. Dan Berry: This is Make It Then Tell Everybody. I’m Dan Berry. Jason Little and I sat down to talk about stealing like an artist, the difference between traditional and digital production methods, and his cartooning DNA. This is Make It Then Tell Everybody. Hi Jason Little, how are you? Jason Little: I’m good, how are you Dan? DB: I’m pretty good. I am full of optimism, and good health. JL: I’m glad to hear it. DB: Now you’re a cartoonist, illustrator, educator? JL: I don’t even really call myself an illustrator anymore, but definitely cartoonist and educator. I tried to get back into illustration when I needed money recently, and it was impossible. I feel like at this stage in my life, I have to put my eggs in as few baskets as I possibly can, just because I need all the neurotransmitters focussed on specifics. DB: All that focussed brain energy. DB: So the thing that you’re focussing this energy on at the moment is comics? JL: Yeah. If you look at my website there’s still an illustration page, but I haven’t gotten a nibble with illustration in a long time. JL: Throw me a bone dudes. I’ll take it! JL: No, I’m not adverse to it. I would actually love it if people who like my comics saw the imagery there and wanted to do something, do a magazine illustration or any sort of illustration that incorporates a similar sensibility so we could find common ground. I feel like that would be a good relationship. DB: That’s a really good foot to start on, so hey people out there, if that’s the kind of thing you want, get in touch! So you’re predominantly a cartoonist then? DB: Do you call yourself a cartoonist, or do you have a different job description? JL: I do call myself a cartoonist. I’m very much interested in the whole history of comics and comic strips, and cartooning, and I feel like all the strip cartoonists from the early 20th century that I revere, they all called themselves cartoonists, so I’m part of that tradition. DB: You’re part of that heritage, that continuity. DB: Who are the go-to cartoonists then, for you? JL: Gee, from the whole history of cartooning? DB: I think some of the early ones, because I’ve got a real soft spot in my heart for George Herriman. JL: Oh yeah, definitely. I feel like I’ve only recently gotten George Herriman. JL: Definitely when I was younger I would look at Krazy Kat and feel like it was a thing that I had to read, you know, just like to eat my vegetables, kind of thing, when I would rather be having cake. JL: You know, cake would be, like, Mad comics from the 1950s. I realise that the obstacle for me was the voice, and the voice is definitely a selling point of Krazy. I mean, that’s one of the great assets, one of the great, amazing things about Krazy Kat is the voice, but it was obscure to me until one of my kids pulled a Krazy Kat volume off the shelf and said, ‘Daddy, read this to me.’ Then I started reading it and I had to do all the different voices, so I did a squeaky voice for Ignatz, and I did this Brooklyn accent for Krazy and a gruff authority voice for Offisa Pupp. It’s like, ‘Oh, now I get it,’ that’s what it’s all about. DB: You had to vocalise it. JL: Exactly, and then it just flowed. Then I could hear the voices in my head as I was reading it, and then it became a living thing to me. DB: That’s cool. Yeah, I’ve not thought of it that way, but it is the voice of the characters that are so distinct and unique for me that I like that it’s… it feels like a very open world that they live in, but at the same time very, very confined. I don’t know how to describe it. Answers on a postcard I guess, I don’t know what it is I like about Krazy Kat, but I really do like Krazy Kat. JL: I also have always had a hard time reading Shakespeare, for example. Sort of, dense, challenging language. I feel like I’m still not quite old enough for Shakespeare. I haven’t tried it in maybe ten years. Maybe I’m due to give it a shot again. DB: Yeah, because I remember when I was at school we had a particularly good English teacher who made us take apart portions of Macbeth. There was a portion where he’s talking about ‘shrouded in sea fog’ or, ‘wearing the mist like a cape’ or… argh, someone’s bellowing curse words at their iPlayer right now, because I’m getting it so wrong! You know, she made us sit down and analyse, like, what is it that he’s actually saying? Take it apart, what is it in terms of the visual? What is it in terms of the emotion behind it? It was really good, because then you go, ‘Oh, I understand it now! He’s making it up as he goes along. Oh, fine, fine I get it now.’ It’s kind of poetic. JL: Oh that’s great, so that’s a humanising thing too. You can, sort of, feel the artist’s process. He becomes a real person at that point. DB: Yeah, but I think that with a lot of things, you need that person, that guide, that person to take you into it. Did you have a guide with comics? JL: Not really. I’ve always, kind of, just… I’ve definitely had various short term guides for drawing and cartooning and stuff like that, but in terms of, I guess the classic, sort of, archetype is, like, the Hernandez brothers had Mario, the older brother, and I’m sure he turned the younger brothers onto all those amazing comics. Then Robert Crumb had his brother Charles, and I think Pete Bagge’s brother was a cartoonist also, there’s this often this older mentor figure, and I never really had that, except I always forget that we just did have a lot of comics in the house, because my father is an obsessive Pogo fiend. DB: I mean, people who aren’t aware of the strip might… that sounds kind of sinister, a Pogo fiend. JL: (Laughs). He’s a Pogo pervert! No, he’s an obsessive Pogo, Walt Kelly collector. That’s branched out to other things too. He really likes Milton Caniff and we had a copy of a giant Nostalgia Press Windsor McKay Little Nemo collection in the house. So that was definitely something that was around, so I know it existed, so it was part of the culture. DB: Is that where the cartooning DNA of your work comes from then? JL: I think it kind of does. I mean, since all that stuff, the early stuff I was exposed to was early strips. There was also a Harry G. Peter Wonder Woman comic that we had, and then later on I discovered these Fabulous Furry Freak Brothers comics that he had hidden in his underwear drawer. JL: And some issues of Zap too. DB: Wow. Keep out of the kids’ hands. JL: Yeah, so when you think about it, those are really my main areas of interest as a reader, are early strips and underground comics. JL: My tastes haven’t changed since then. DB: You’ve failed to progress! (Laughs). JL: (Laughs). So be it. DB: Sorry. So when did you first start drawing comics with any real direction then? When did you start taking it seriously? I think everyone drew comics when they were a kid. You know, when you ask ‘when did you start drawing comics?’ everyone says, ‘Oh, I always drew comics,’ but when did you start taking it really seriously? When did you think it could become a job? JL: Well, I was lucky enough to take a class at a community arts centre in cartooning, and my teacher’s name was Gary Shaheen, and he was a local artist and he did painting and collage and also comics. He had a lot of enthusiasm, was a great teacher, and I did a nice little body of ten year old’s quality work in that. DB: Were you ten at the time? JL: I was ten, and then I stuck with it. He offered an intermediate class and an advanced class and I did those two, and then at the end of it there was an exhibit and I won a little prize, which was an original John Buscema page. JL: Yeah. He had guest judges who were… one of them was Ray Gotto. I don’t know if you’ve heard of Ray Gotto, he was a sports cartoonist. He did an American strip called Ozark Ike. DB: Oh, I’ve heard of that but I hadn’t heard the name. JL: In the ‘40s I think. So I shook his hand, so that was neat. JL: Then after that I just stuck with it, so high school strips and college strips. DB: So in, like, the college paper? JL: Yes, four panel strips. DB: So that’s a format that you’re pretty comfortable with then, at this point I should think. JL: It turns out yeah, I always wanted to do a strip. I’ve always been interested in comics, but also the idea of the, sort of, mass audience that a strip brings. It seemed like the thing to aspire to. DB: Some people listening might think of doing just four panel things as being very, very restrictive. Do you find it restrictive, or do you find it very, very liberating? JL: I’ve found it liberating personally, almost through its restrictiveness, in fact. 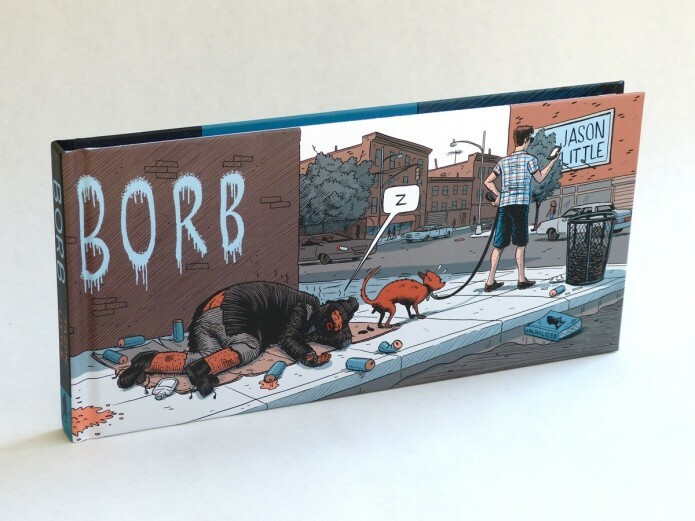 It meant that, for example, if you look at the book that I did… so the latest book I did is called Borb, and it’s a collection of four panel strips. JL: Out May 1st, yes, thank you. JL: Indeed, always be closing. If you compare that project to the book that I did previous to it, which is called Motel Art Improvement Service, and one book has only panels of all the same size, only four panels on a page. DB: This is the landscape format as well. JL: Exactly, and the previous book has full colour panels, and panels of all sorts of different sizes and shapes, and so the older project is much more concerned with beauty and polish and flash. You know, we can have big establishing shots and views of landscapes and panoramic images and all that stuff, but I couldn’t do any of that with Borb, so I just was able to do the work way faster, and with more of a sense of urgency. I feel like that just informed the work’s energy so much more. I feel like I’ve gotten a more positive response to this book than I have for the big, fancy colour book that I did previously. DB: That’s interesting. Maybe this is a bad question, but how do you feel about that? The one that, you know, it was quicker and kind of looser gets a better reception, or, you know, people like more than the one that was more heavily polished and took longer. JL: I feel like it’s just a better communication tool. I mean, Chris Ware for example, has talked about Peanuts as being an archetype for comics as language, in that the way we process the imagery in Schulz’s Peanuts is cognitively similar to reading a sentence, because the pictures are so symbolic that they function almost like… they probably light up the part of the brain that processes language at the same time as the part that processes images. JL: Yeah, exactly. In fact I even discovered a study that someone had done with electrodes on the scalp, and everything like that. DB: I love studies like that! JL: They had the subjects read Peanuts and see which parts of their brains lit up, and it validated everything that Ware had said. DB: Ah, Ware the neuroscientist. Nice! JL: So anyway, it took me a long time to stumble through being fixated on beauty and instead, kind of, try this new way of making comics that is more like basic communication. So that’s not to say that I’m giving up entirely on beauty and colour and polish and flash, but I’d like to incorporate what I’ve learned from this project into other ways of making comics too. DB: I don’t know if there’s an answer to this question, but do you have strategies for approaching this kind of thing? So now you know that you’ve got this as an aim, a thing that you want to incorporate into your work, but you don’t want to leave beauty behind, so do you have strategies? Is it a bullet point list, do this, do this, do this, or is it more of an intuitive thing when you’re trying to incorporate these disparate ideas together? JL: It’s definitely a bullet list. DB: Yeah? Kind of analytical? JL: Not in terms of content, but in terms of form. Like, this project will… like if you look at Borb, this project will be four panels, it will be drawn at print size, it will be predominantly drawn with nib, it’s not going to have gutters in between the panels, it’s going to try to evoke Gasoline Alley, Frank King, Little Orphan Annie, Harold Gray, it’s got to be hand lettered. So it’s a set of constraints. DB: Oh, so you give yourself requirements? DB: And if you don’t meet those requirements, it’s not working? JL: Not, it’s just like a framework. It allows me… if I have a framework like that, then I don’t have to worry about stuff that’s outside that framework. DB: Oh, it’s a stress-relieving device? DB: Nice. I’m a huge fan of those things. Do you have any other stress-relieving strategies? I keep using the word ‘strategies’, and I don’t think it’s the right word. JL: That’s good, no, I like strategies. It invokes Brian Eno. JL: Gosh, I don’t know. Well, with other projects I mean, my studio mate Reilly Brown, who is famous for doing Deadpool for Marvel, which is very different from the kind of comics I do, I was working on Borb, and I had a page on the table and he came over and peeked at it, and said, ‘Oh wait, did you do this? I didn’t even realise this was about you. Every project you do is so different, man.’ So I feel like, yeah, I do want to try to do something differently every time, so meeting a set of rules like that helps me – forces me to not get stuck in a rut, and to try something different every time. DB: So the rules change each time, but the way you approach it remains consistent, I guess. JL: I guess so. I hope so, just because I’m me. DB: Yeah, well I think that’s the consistent thing, surely, I hope. (Laughs). JL: I continue to be me. DB: Excellent. Well that’s good, excellent news. So where do you start with a project then? JL: Textually, though Borb is a little bit of an exception to that. So usually I do a long plot for a story, assuming that plot is the prevailing important thing about it. Then the plot gets revised several times, and shown to trusted confidants who read it and give me commentary on it, and then it goes to script. DB: Can I ask you about the trusted confidants? DB: Because this is something that I do as well. I’ll do something and then I’ll show somebody and say, ‘Is it okay? Is it okay?’ It was very, very difficult to start doing that. I find it really counterintuitive because it’s not finished, you can’t see it yet, it’s not… you know, that’s my impulse straight away, is, ‘It’s not finished, you can’t see it. It shouldn’t be out there.’ So actually showing people before it was this perfect, finished, printed, bound, whatever thing feels very much uncomfortable. It’s a bit like lifting up your shirt and showing everyone your tummy. DB: Did it come easy to you, to be able to show people work in progress? JL: Kind of. I mean, I went to college and was a studio art major, so group crit was part of the experience. By the time I was done with school I was into it, so I was comfortable with that back and forth thing. But then the, sort of, on going commitment to critique really came out of my marriage, and my wife is a writer. She studied creative writing in college a little bit, and then took that writer’s workshop sensibility and imparted all of that to me, and gave me hard but encouraging critique on everything I do, and then she and I share some readers who are friends of ours, who give us feedback. So it’s a great, kind of, on going thing. DB: Okay, sorry, back to where you were. So you were saying you put this out to trusted confidants for critique, and then when it comes back, I forgot what you said after that because I was interrupting you. JL: So then it’s all about revising, and so when it’s a text I try to show it to writers, predominantly, or readers, and then once I’m done with it as a script, then I try to show it to my cartoonist friends, as layouts, with all the text in it. DB: Oh, so when it becomes a visual thing, you show it to the visual people. DB: Okay, that makes sense. JL: I find that if I show it to people who aren’t artists, they get really distracted by the images, and the things that they say about the images are not necessarily all that helpful, so I try to let people specialise. DB: Whereas you say, ‘No, no, read, read, read.’ (Laughs). JL: I try to keep all that to the… so if I can get as much feedback in, sort of, plot, script and layout, then the pencilling, inking and colouring is all, you know, I can just, sort of, motor through that and not get bogged down. DB: So it becomes, kind of, automatic, because you’ve already made all of your decisions? JL: I hope so, yeah. Ideally. DB: This is one of the things I try and impart on my students, is make your mistakes early on. When it’s rough, you know, get it wrong when it’s rough, because you don’t want to have to change things once it’s fully drawn, coloured in, you know, and you’re ready to send it to the printers. JL: Yeah, exactly, when it’s still plastic. DB: Exactly. So what’s your process then for putting pen to paper and actually drawing this thing? JL: Heretofore it’s always been ink on paper, and with some variations, like, with my Bee books I would scan the layouts, bring them into InDesign, computer letter it there and then print all that out on Bristol paper, with the layouts turned cyan, so that I could then tighten up pencils on Bristol, and then ink on paper, and then scan back in and colour in Photoshop. With Borb I did it all on paper. The computer was not used at all, except there are a couple panels where I have photographs collaged into thought balloons, I did those in Photoshop. DB: You didn’t painstakingly reproduce them by hand. JL: Right, Ben-Day dot by Ben-Day dot. JL: With Borb I just had a page of gag ideas that were all derived from the horrible misfortunes that homeless people suffer, a page that I called the litany of misfortune. So each of those ideas usually became a six day cycle of strips. Then for those, instead of working on typing up a script or anything like that, I would just write down the dialogue or the panel descriptions on a little piece of paper, and then not do layouts, instead just pencil directly on the Bristol board, and then ink it. I would pencil and ink a strip a day, and then upload it the same day. DB: Wow. So how long would that take then? JL: Four to eight hours, maybe, depending upon how fussy I felt, or whatever needs I had to take care of that day. DB: Pretty good. So have you ever been tempted then, to switch over and do everything entirely digitally? JL: I am being forced to do that now actually. The reason being that I wanted to add a class, so I teach cartooning at the School of Visual Arts, and right now I teach a drawing class. DB: In New York City? JL: In New York City, exactly. Right now I teach a drawing class for cartoonists, and I also teach one of the sections of the introductory tools, technique and process class, which is basically how to ink, how to hand letter, other things like that. DB: So the core, fundamental, base level, ‘if you can do this you can then move onto the next bit’. JL: Exactly, but I wanted to add a class. So SVA recently finally gave cartooning and illustration its own computer lab. JL: Yeah, so we were the last department at SVA to receive its own computer lab. Interesting. The founding department. DB: You’re headlining, let’s say. JL: Yeah, the school used to be called the School for Cartoonists and Illustrators back in the ‘40s. JL: Yeah, it was a school founded by Burne Hogarth. DB: Oh, I knew this! JL: That was the original name of the school, and it was definitely part of the whole movement or wave of cashing in on the GI Bill. So all these soldiers were coming home from the war and needed to get their lives together, so a lot of them wanted to go to school, so there was government money for school. So suddenly all these people got into the education business. JL: Yeah, exactly. Anyway, so we finally got our computer lab, and I said, ‘Gee whizz, maybe somebody should finally teach the all digital process class,’ and I thought, ‘I don’t want to teach that class, I’m working on paper.’ Then I was thinking, ‘Why don’t I want to teach that class? Because I’m afraid to, because I’m worried about being changed, about that digital stuff getting under my skin and, like, modifying me somehow.’ I realised that that was juvenile thinking, and that I needed to allow something to transform me, if that’s what has to happen. And you know, maybe it won’t even transform me, but anyway, I signed on to teach this class. So I’m teaching the all digital process class, and I know all that stuff from having played with it here and there, so I’m going to tackle it. Anyway, so the reason being, I need to do my next comic all digital, just so that I can speak with authority about it, and know what I’m talking about solidly. DB: Yeah, that makes sense, because I think my journey was, kind of, the opposite one to you. I started out just computers. My background was in design, multimedia, installation programming stuff, then I came to drawing a little later on. So when I started drawing it was pretty much entirely digital. I wanted the computer to replace a lot of my thinking I think, if I’m honest, and I think the older I get and the more I do, the more traditional I become in the tools and the approach, and the way that I draw, because I really like the tactility of it. I really like having inky fingers and feeling a nib against the page, sort of, cutting in a little bit. That’s stuff I really like. I don’t get the same… for me, I can make the computer do what I want it to, but it doesn’t make me feel the same way. JL: That’s the way I feel now. Everything about working on paper feels right to me, and I’ve certainly invested enough time in it at this point, because I’m actually pretty good at drawing on paper. Why the hell would I want to not do that? But I just feel, like, since doing everything on a computer is a relative unknown, it’s like, that’s an area of exploration that I should pursue. DB: You’ve been exploring 3D comics as well. DB: Is that something that you do traditionally, or digitally? My hunch would be digital. JL: That’s something that I’ve always done digitally, though not entirely digitally. I draw everything on paper, and then I scan it and colour it, if applicable, and then transform it in Photoshop into 3D, stereo images. DB: Can I ask how that works? This is a really dumb question, but how do you do that? DB: I bet that’s a really long question I’ve just asked. JL: 95% of your listeners will glaze at this point. It’s all about taking one image, take one panel for example, and then duplicating it, so you have two of them. Then superimposing them, and then pushing all the colours in one of the images towards cyan, and pushing all the colours in the other image towards red. Then they’re superimposed transparently, so you have two copies of the same image superimposed. Then when they superimpose transparently, it reverts to the appearance of the original panel, a full chromatic spectrum. JL: Because you’ve got all three RGB channels firing in the equal amounts that they did in the original drawing. JL: So then you take the one that’s been pushed towards red and you start to mess with the position of objects in that panel, and things that you want to come forward in the 3D space, you slide to the right. Things that you want to recede in the 3D space, you slide to the left. I might have that backwards. DB: Does this depend on which colour lens is in which of the glasses? JL: Exactly, and it’s standardised. Usually the blue lens is always on the right eye. DB: I didn’t know that. That does make complete sense. I should have guessed, really. JL: So then you’ve moved things around in one of your pairs, and as a result you’ve created little gaps in the artwork, since you’ve picked something up and moved it. You then have to draw in the space, draw in that gap to recomplete the artwork. DB: So you get that depth. JL: So it’s like the experience if you put your hand up in front of you, and you alternate closing and opening your eyes. DB: The position of it moves. JL: Yeah, alternate winking, you can see that your hand will seem to move back and forth in space like that. It’s the same principle. DB: I get it, okay. DB: Yeah, my father-in-law can’t do that, he’s only got one eye. So if we go to see films, people try and give him those 3D glasses he waves them around. I don’t need them. DB: I’m not even going to go see this film, this is no good for me. JL: Art Spiegelman has monocular vision. He is blind in one eye from an accident in childhood. DB: I didn’t know that. DB: ‘Do you want to have a look at some red images?’ (Laughs). DB: Where do you get your ideas from? JL: That’s a really good question. I love that question. JL: I think it’s a popular misconception that artists receive ideas, kind of, by divine visitation. So I feel like young people who aspire to be artists, or even old people who aspire to be artists, think that they arrive like emails from God, like a bolt out of the blue. That’s not the case, it turns out. I feel like there is definitely the experience of, sort of, spontaneous inspiration. Like, you’re doing something banal, like walking the dog or taking a shower or something like that, and suddenly you have this idea and you’re not entirely sure where it came from, but by and large, getting ideas is the product of immersing yourself in lots of stimulation. That doesn’t mean getting a massage every day. DB: But if it works, you know, if it ain’t broke, don’t fix it. JL: Right, exactly. It’s not bad for you, that’s for sure. That means reading a lot. Reading news and reading non-fiction books, reading novels and watching movies and watching documentaries. The result of all that, sort of, marinating yourself in a mixed cultural soup allows you to start making connections between those things. ‘Oh wait, what about a essay comic that’s about this science book that I’m reading, that uses that thread from the science book, but the narrator is very much like the protagonist of this Nabokov novel that I’m reading now, but then the whole thing will be in this psychedelic colour palette that I’ll steal from these Martin Sharp psychedelic posters that I’ve been looking at,’ just to pull a couple things at random. DB: So ideas are the product of things going into your head. JL: Exactly. There’s a really great book by a writer and cartoonist named Austin Kleon, which is called Steal Like An Artist. JL: Yeah, and I have my students read that. His basic thesis is that since everything’s been done before you should feel liberal about cherry picking ideas from previous artists. JL: Definitely the word ‘steal’ is an intimidating clause in that. DB: But the way I think about it is, in terms of ideas is, if you steal it, you’ve made it your own. I think borrowing ideas is worse, you’ve got to give them back, but if I steal your Blu-ray player, it’s mine now. It’s mine. You have no Blu-ray player! But borrowing, you have to give it back I think. ‘Steal’ I think might be the right word, because you have to take ownership of it. JL: Exactly. It’s about incorporating the idea. It’s like taking it into yourself, and then making it your own, and regurgitating it again in a way that, you know, puts your thumbprint on it. DB: I think the problem for me with talking about ideas is, we don’t have a really good vocabulary for talking about it. We don’t have enough words that say what we intuit, and what we feel when we’re actually having ideas. It’s very difficult to describe the sensation of having an idea and going, ‘Oh, oh, oh, I know what it is.’ It’s that noise, rather than it’s the intense pleasure as a result of… and I’m losing my words and I can’t think about it. Do you have a similar thing, where you find it difficult to verbalise the creative stuff that goes on inside your head? DB: So you had this idea about this sculptor. JL: Focussing exercise, so he was maybe singing ‘Mary had a Little Lamb’ violently in his head, because he was really worried that he was going to inadvertently screw me by stealing my idea. DB: But I do this as well. Bless him, he’s a good guy. You see, I have a very, very similar thing. When I’m working on a story, I find it so, so difficult to watch films or read books or read other people’s comics, because I take it in. I take it in, it’s there, and it’s right on the top, and I really worry that then that’s going to sneak out of the end of my pen without me realising. So I have to be quite strict, I think, with myself, that I can’t listen to fiction in the car, for example, if I’m working on a story. I think it becomes less me, if that makes sense. I don’t know if that makes sense. JL: I see what you’re saying. I don’t have that problem myself, I think I’m just… I metabolise things extraordinarily slowly, so I feel like I spent many years in my early days not incorporating other people’s imagery, or ideas into my own work, because I hadn’t learned the importance of it. Then I find that I actually have to be really deliberate about incorporating inspirational material from other people, and I have to, sort of, make a to-do list. Like, ‘For god’s sake, make this look like Harold Gray. Don’t forget.’ I’m glad that I’m in a groove with that, because I feel that’s given me a real shot in the arm. DB: So you’ve worked on this idea, how does it make the transition from your head onto a piece of paper, or into a computer? And then how does it develop into that first pass at a story? JL: So the first thing I do is, if I’ve worked something as a text or if I’ve just gotten a moment of inspiration, or whatever, then I’ll write it down. Then maybe I’ll do some drawings of it. DB: I think that that’s really important, because I know that if I think, ‘Oh, great idea, I’ll remember that, that’s great,’ it’ll dribble out of my nose and ears while I sleep, it’s gone. JL: (Laughs). Right. But the expectation that I have, so I’m going to get this down, and it’s going to be bad. DB: Oh yeah, yeah, yeah. DB: I think that some people don’t get that far. Obviously I work with students and I see people very, very regularly, you know, having an idea, and talking about it, and then going, ‘Ah, but it won’t work.’ Now it never will, you’ve not let it, you know? JL: They just committed infanticide on their own idea. DB: They’ve just sat on it, and now it’s dead. The poor little idea. But I do think that ideas need to be inflated with work. They start out as these limp little critters that don’t quite work, and they’ve got to be inflated, and they’ve got to be brought to life a little bit through hard work. Do you find the job of taking, like, this little, limp, un-inflated thing, and beefing it up into a thing, do you find that difficult, or do you find that enjoyable? JL: I find it, I guess both. I don’t know. I feel like that’s where the real work is being done. JL: But it’s definitely, like, when I’m in that stage it’s often really hard to commit to it, because it is so hard. So when I’m doing that it’s like, ‘Oh god, doing layout is so hard!’ This is hard, taking the text and making it into images, or doing that last revision on a text. JL: Maybe that’s why you take to the interview form so well too, so talking is a good way of thinking for you. DB: I think so, yeah, but I wonder if other people have similarly… let’s have a think. Now you’ve made me aware of it, I can’t think at all. Thanks very much. Well this is getting edited out! But if other people have a similar response to thinking in different ways, do dancers think better through movement, for example? JL: I like that, yeah. DB: Maybe. I think I can rank the different ways that I think, and I think just shutting up, closing my eyes and thinking, I’m rubbish at. I’m really terrible, I just can’t do it. I can, but it’s not good. JL: I don’t even let my students call that thinking. I call that the path towards falling asleep. DB: (Laughs). It’s called dozing. Yeah, but I think I can rank it as talking and drawing at the same time, I think is my golden combination. JL: That’s great. I agree with you entirely on that. I do drawing demos, like, ‘here’s how to ink with a nib’, and then I’ll have to talk the entire time to explain what I’m doing, and I’ll find that my focus is fantastic, and I get the drawing done way faster than I would have if I was just at the studio by myself, not saying anything. JL: And my thinking is crystalline too, because I’m… you know, maybe it’s not a good idea to be analytical and draw at the same time, because you might get in the way of yourself, but in that circumstance, it’s like, without a net I feel like it’s really effective. If I can have the classroom in front of me while I’m doing all of my pages, I feel like I’ll really get a lot of good work done. DB: Webcast everything! Live online! Oh boy. So you’ve got Borb, it’s been out at festivals and conventions so far, and it’s going to be available online soon, and in shops. JL: It is, yes. May 1st. DB: So, where can people buy this? JL: You can get it directly from the Uncivilized Books website, uncivilizedbooks.com. You can get it from all your usual book outlets, and I’m doing, I think, 19 events this year. JL: A few in Boston, Providence, Baltimore. DB: So where can people find out this hectic tour schedule? JL: Let’s see, I’m going to put it up on Tumblr I think today. I’ll do that. DB: What’s the web address for Tumblr? Do you have a blog? JL: My Tumblr is littlebeecomix.tumblr.com, and I’ve got a Facebook page, Bee Comix is my Facebook page. Everything I do that’s on Tumblr ends up getting pushed to Facebook and Twitter anyway, so it’s all the same. DB: So Tumblr’s the hub. DB: The Tumble-hub. Excellent. Jason, thank you very much for speaking to me. JL: It’s been my great pleasure Dan, thanks for having me.